Good afternoon… I hope everyone is having a good one! I recently discussed 15 Things to Evaluate Before Making a Budget on the blog (if you haven’t read it yet you should go check it out!) and it is the first step to take before beginning budgeting. 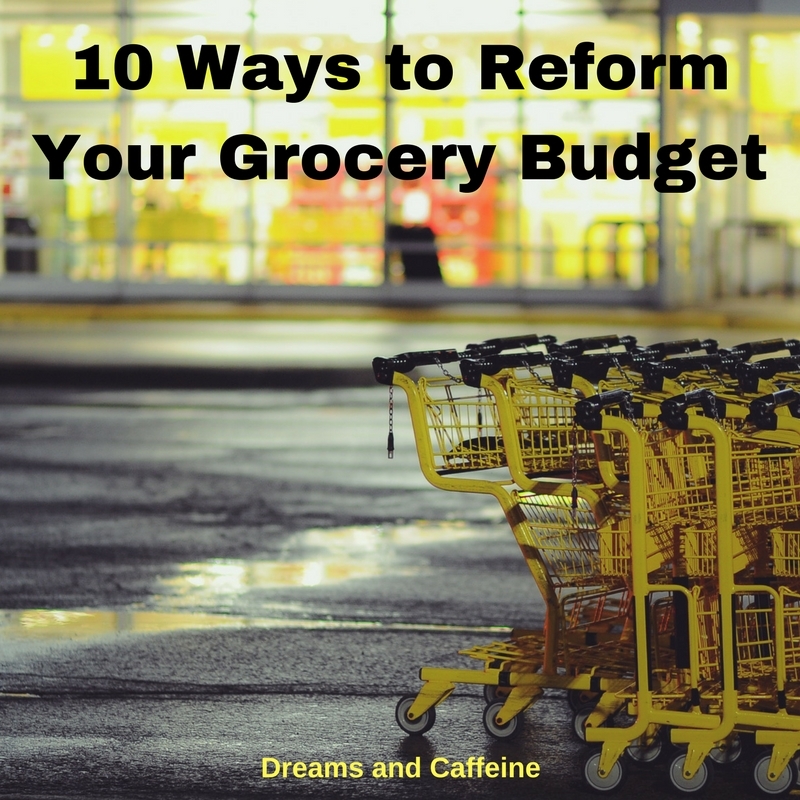 Today, I wanted to dive in even deeper in the budgeting world and discuss 10 Tips to Reform Your Grocery Budget. I seriously hate spending money on food, but apparently you have to in order to survive. Prior to starting this budgeting journey, we generally ran to the store and grabbed whatever we needed plus a ton of stuff we didn’t. I don’t even want to talk about how much food we wasted, because we didn’t have a plan and would randomly shop and then forget it was in the fridge, thus letting it expire. I never really saw this as an area that needed to be improved, until my husband brought it to my attention. A few months ago, my husband randomly got our grocery store rewards and looked at the credit we received for shopping there the last three months. He was shocked that we had spent over $1,400 per month on groceries given we are a family of four, two of which are toddlers and don’t eat that much. This amount also does not include our household supplies (toilet paper, paper towels, cleaning supplies, etc.) nor our trips to get coffee or dining out. I seriously almost had a heart attack when he said that number… there was no way that was correct! So, we sat down together and went through our bank account and to my complete and horrid shock… he was correct. I almost cried (partly because he was right and the other part for spending that much on food)!!! Seriously though, if I’m going to blow the budget… I would rather blow it on something fun like a vacation or CRAFT SUPPLIES for blogging!!!! Since that horrifying day, we have reformed our grocery budget to $550 a month and that includes our household supplies, coffee runs, and dining out. That is a monthly savings of $850 to put towards something else! How insane is that?! I will admit when we first started this venture, I wasn’t sure if it was truly possible. Then after the first successful week, I knew it was more than possible and I was hooked on the challenge of making sure it happened!!! Please understand that I am not an extreme budgeter that uses tons of coupons, only shops generics, and eats mac n’ cheese every night. I am a realist when it comes to budgeting and I am not willing to give up things I love just to save a penny. However, I am willing to reduce purchasing things, meal plan, get organized, and cut corners here and there to save hard earned money. So, if you are interested in tightening your grocery budget and figuring out how to spend less money while still enjoying life… keep reading! I know a lot of people suggest figuring out what you need to spend and setting that as your budget. I disagree, I decided on how much I wanted to spend each week on groceries and then built my menu around that number. Be sure to make a detailed list of what you need so you don’t forget anything while you are shopping. If you forget something, then you waste extra time and money on additional trips to the store. If you are new to menu planning… KEEP IT SIMPLE until you get the hang of it! I began by just planning dinners and then having a few things to eat for breakfasts, lunches, and snacks. I planned one dinner without meat (because meat is expensive), I had one meal that was breakfast, and then one meal that was saved for dining out. The rest of the week’s meals I tried to make sure they were easy and stuff I had made in the past. I know this sounds boring, but I did this the first few weeks until I got better at menu planning. Then I started evolving my menu, while keeping with my set budget. Be sure to check your pantry and cupboards before you go grocery shopping. Also try to stick to meals that have ingredients that you will regularly use. Set the budget and stick to it! No excuses! I highly suggest using the cash system for these. That way when the cash is gone, there is no more eating out or coffee runs until next week’s allowance. I have found that some items that our family regularly eats are cheaper if you buy them in bulk. Make sure you have the area to store the extra and be sure to watch the experiation date… you want to make sure you consume it all before it expires. I have never been a sale shopper, but now that I have a budget I try to find items that are on sale. If the budget allows, I may buy extra if it’s a good deal. I am not a huge fan of coupons, however; I do suggest utilizing the coupons you get when you check out at a store. Generally, those coupons are based on what you regularly shop for so you know you will use them. I stick them into my wallet so I don’t lose them and can easily pull them out when I go to pay the next time I am at the store. Remember… coupons are only beneficial if you are buying stuff you normally buy. If you are using a coupon to buy something you normally wouldn’t buy… then you’re not saving any money. I will admit that with certain items I am not willing to buy generic because I can taste a difference. Certain items, however, I am more than willing to buy generic to save money. It is important for you to review your grocery list and see what you’re willing to buy generic and what you’re not willing to buy generic. Though it is usually cheaper to buy generic, I have found certain items not worth the savings. Pay attention and be willing to experiment. As a mom that has two toddlers very close in age, convenience always wins. If there are enough good deals to make it worth the gas to go to multiple stores, then I make sure to have a list and a plan. For added convenience, I try to shop without the kiddos, but if that is not an option then I make sure both kiddos are not hungry, I have snacks with me (just in case), and they have already had naps. Occasionally, it still doesn’t work out, but I definitely get an A for effort! We shop organic, which is why it is hard to reduce our budget much more than it already is. If you are also into shopping for organics, I suggest trying your local farmer’s market or self-pick farms to get better deals. Another place to check out is Costco… they have increased their organic selection stock and the prices are usually pretty great. To save money, we have started making our own freezer meals for those nights when we just don’t want to cook. I have found that it is cheaper than buying a freezer meal and, in my opinion, it tastes a lot better too! Crockpot meals fall under this same category. They are quick and easy and you can find a ton of wonderful recipes out there. Here are some of my favorite places… go check them out! I don’t think this one needs much of an explanation;)! I hope this article motivates you to start watching your grocery budget! Just remember, any money saved can be invested in your future or you can have extra money to use for vacations, paying off debt, or whatever you see fit. If you are looking for a more in-depth look at budgeting, you should check out Rosemarie at the Busy Budgeter. And if you are looking for more great ways to save, check out Crystal at Money Saving Mom. Have a happy day!